A 1/25 oz. gold coin featuring a design inspired by the Canadian nickel is attracting the attention of collectors. 75% of its limited 7,500 mintage have sold, according to the Royal Canadian Mint. Marketed as an affordable gold product, the Mint’s 2014 50c Proof Beaver Gold Coin is available for CAD $129.95, or about US $118.32. It is enjoying 4.7 out of 5.0 stars based on 15 reviews found on the coin’s product page. In pros and coins of reviewers, it has the highest marks for beauty and quality with the 3 cons noting its small size. Found on the reverse is G.E. Kruger Gray’s design of a beaver sitting on a rock, adapted to a smaller size for the 50-cent gold coin The beaver design has been featured on the Canadian 5-cent circulation coins since 1937. "The beaver has a long history in Canada as both commodity and cultural icon. 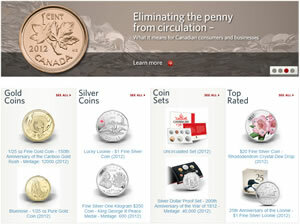 The Hurons honored the beaver hundreds of years ago as the totem of their tribe," the Royal Canadian Mint website notes. "Native peoples used the beaver emblem to sign treaties with the first colonists. Since then the beaver has appeared in the heraldic bearings of Quebec City and Montreal and even marked Canada’s first postage stamp." As a comparison in composition, size and weight, Canadian nickels for circulation since 2000 are minted from 94.5% steel, 3.5% copper and 2% nickel plating; have a weight of 3.95 grams; and a diameter of 21.2 mm while the new 2014 Beaver Gold Coins are composed of 99.99% pure gold to a weight of 1.27 grams and a diameter of 13.92 mm. At gold’s current spot price of $1,321.90 an ounce, the gold coin has a melt value of about CAD $59, or US $54. Obverses of the coins feature Susanna Blunt’s effigy of Queen Elizabeth II. 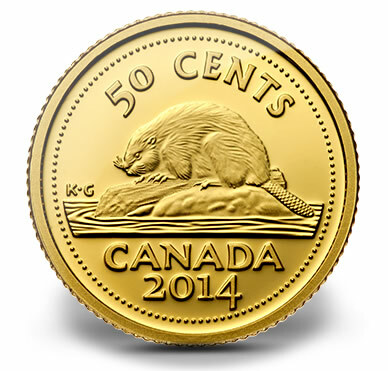 The 2014 50c Proof Beaver Gold Coin is available online at mint.ca. 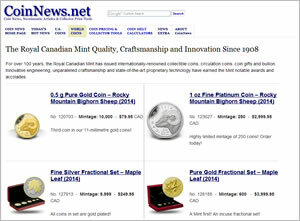 Here is an affiliate link to all new Royal Canadian Mint gold coins . Coins arrive encapsulated and held in a maroon clamshell with black beauty box.